LAKEVILLE, IN. – The 2018 edition of LaVille Girl’s Tennis is smiling from ear-to-ear. 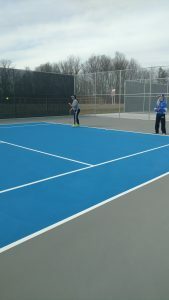 Coach Melissa Haisley and the Lancers are enjoying six new courts. “It was Amazing,” said Haisley as she watched her squad take to the courts for the first time this season. “Honestly, I don’t know how to put it into words. The last time LaVille Girl’s Tennis played at home was the final match of the 2016 season. The old courts were cracking, paint was coming off, and, due to the weather, the net posts pushed up. “There was just joy,” concluded Haisley of the first practice outdoors of the season. The girl’s tennis team will face South Bend Riley on Wednesday April 4. The home opener is set for the first serve at 4:30 p.m.
Annie Marshall and Kelsi Watts will assist Haisley.